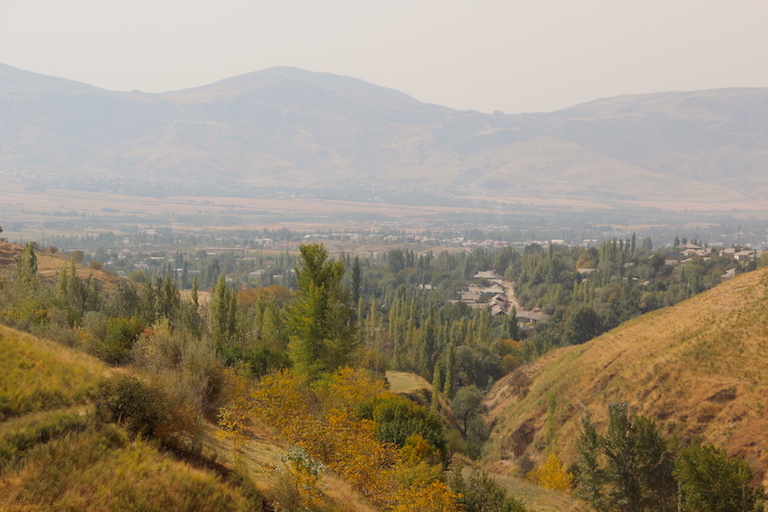 Tajikistan is a dry and mountainous country where agroforestry is increasingly stabilizing soils degraded by decades of overgrazing, while growing food and providing cover for wildlife. 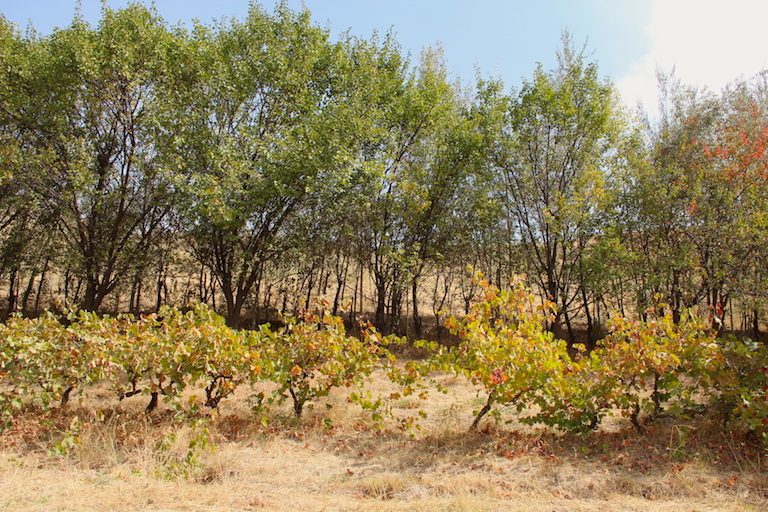 “Alley cropping” is the main agroforestry technique used in the area of Faizobod, in which crops or grains are grown between rows of fruit or nut trees that shield the tender annuals from incessant wind and sun. Farm sizes are generally small, but farmers whom Mongabay visited enjoy multiple harvests annually, including 4 to 5 tons of apples a year in some cases. Agroforestry also sequesters carbon from the atmosphere in the woody trunks and limbs of trees and vines: it’s estimated that there are currently 45 gigatons of carbon sequestered by these agricultural systems worldwide. 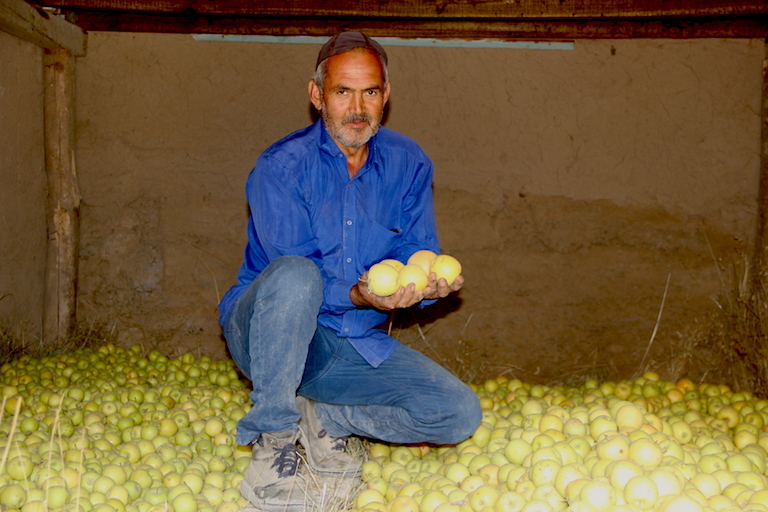 FAIZOBOD, Tajikistan — Mirzoli Azizov, a 54-year-old farmer, is sorting apples from the second harvest this year from his agroforestry gardens in this district 50 kilometers (30 miles) east of the Tajik capital, Dushanbe. It’s still warm and sunny in early October in this mountainous part of Central Asia, which is enjoying a new bounty from what used to be a heavily degraded landscape. 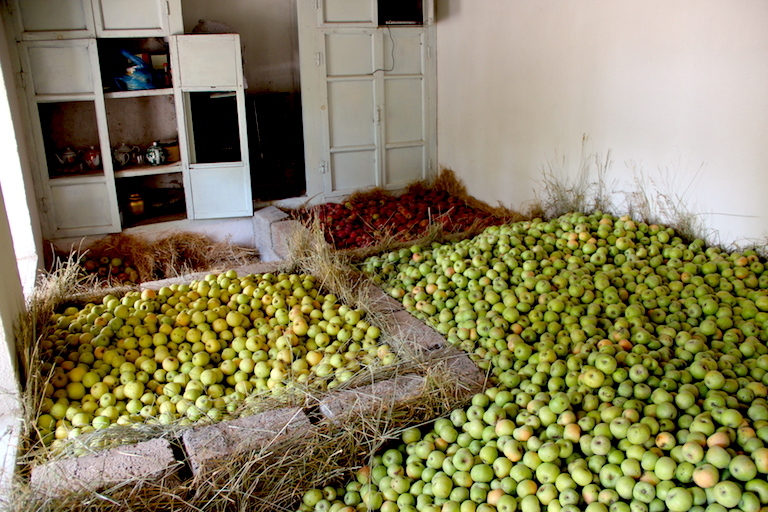 “Here we grow [varieties] like Krepson, Golden Delicious, Khuboni, and Simirenko, including [its] tender type for winter, which is called Red Simirenko,” Azizov says, handling the yellow, green and red apples. During the Soviet era, incessant windy weather contributed to harvest losses here, so to survive, the local community opted for agroforestry gardens and pasturing. The main agroforestry technique used here is the growing of fruit-bearing trees or shrubs in rows, with forage crops or vegetables in the alleys between, in a system called alley cropping where the perennials shield the tender annuals from incessant wind and sun. The apple trees here aren’t grown on flat land, but rather on the side of the mountain, which also has some gardens and trees at the very top. Previously, water was delivered to the heights with pumps and drip irrigation, but that’s become largely impossible now due to water shortages. But the apple and nut harvests this year are rich, despite the poor, rocky soil. The other side of the valley, which lacks such orchards, livestock graze on the meager forage of eroded slopes. 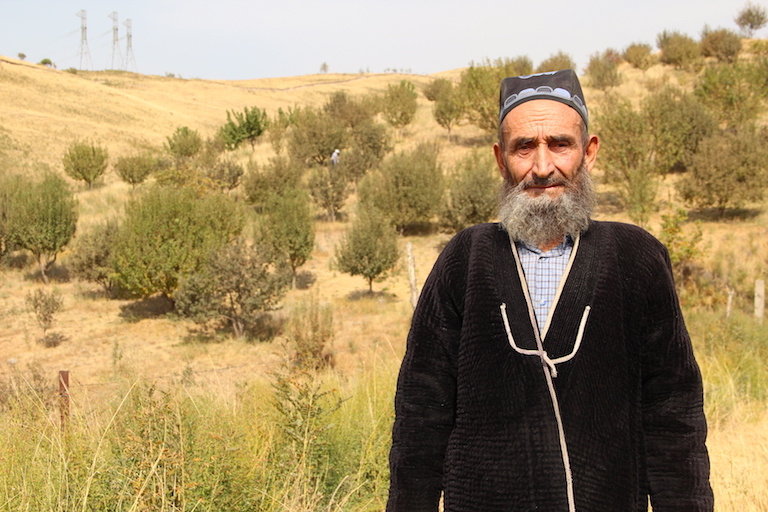 Azizov’s garden is fenced to protect his trees from wind and wandering cattle, which used to roam the area, before FAO consultants advised that the livestock presence be minimized here. Grass now grows on the ground that was trampled. Gado Kayumov, an elderly farmer, works his small farm alongside others on a towering mountain slope beneath the scalding sun. His agroforestry patch used to consist of apple, nut, peach and cherry trees since 1992, when there was an ample water supply. But birds, which nest in this area by the thousands, ate the cherries. So Kayumov switched to growing mainly apples. Now surrounded by his family, he hopes they will continue his horticultural mission. Kayumov is considered a leading gardener in the region. His apples have a very sweet and sometimes slightly sour taste, and they’re ready for harvest now, with a few already on the ground. 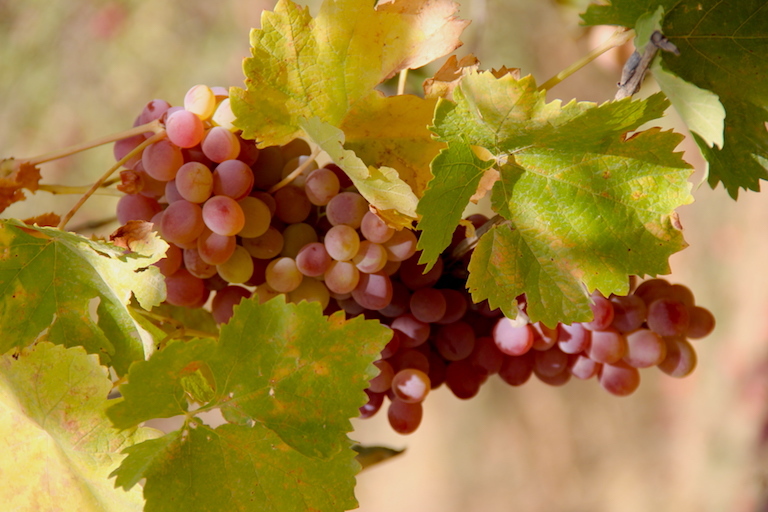 The nuts are yet to mature, while the dark purple grapes are abundant, juicy, and plump. Livestock numbers have risen sharply here in recent years, leading to severe degradation of soil resources on the sloped lands, according to Sanginboy Sanginov, a leading expert with the Institute of Soil Science at the Tajik Academy of Agricultural Sciences. Local farmers growing grains, vegetables, forage and even industrial crops like potatoes can lose 20 to 60 tons of fertile soil per hectare annually due to erosion. But alley-cropping farmers who grow their plants between rows of trees are more successful, Sanginov says. This deha, or village, was established more than 200 years ago. During Soviet times, people were relocated from higher elevations on the mountains to lower ones. Forestry was mainly developed in mountainous and piedmont zones, while the valleys were dominated by cotton, some vegetables, and forage for livestock. After independence, the emphasis shifted to growing grains to provide food security. Traditional agroforestry as practiced for centuries in Faizobod was mainly a way of self-reliance and survival to provide fruits, vegetables and feed crops, because the land plots are small, ranging from 0.1 to 1.5 hectares (0.25 to 3.7 acres). Grain is sometimes grown for self-consumption, but drought, erosion and insufficient watering means harvests are negligible. Meanwhile, the productivity of rangelands, largely bare during the winter, is falling, so the Tajik government encourages more production of forage crops, which provide higher earnings than vegetables and industrial crops. This is especially true when natural grasses like lucerne or sainfoin, which provide two to three hay harvests a year, are raised in the alleys between fruit trees and grapes. Sanginov says the fenced agroforestry gardens improve soil productivity, leading to higher incomes for farmers. But outside, where excessive grazing of degraded rangelands occurs, erosion is decreasing the standard of living among the local population. Apple farmer Azizov says his son will likely stay on in Faizobod and not move to the capital, Dushanbe; the same with his nieces and nephews. “In the city you have to buy everything, whereas here you [provide for] yourself. The majority of the children will probably live here and continue our agroforestry traditions. My son is in fourth grade; I do not know what he will want, but we live here,” he says. The intergenerational transfer of knowledge comes naturally to a farming community where land plots and gardens have traditionally been passed down to sons and daughters, Sanginov says. Each new generation has worked with its predecessors to accumulate the necessary experience. But agriculture is becoming less attractive for young people, and less profitable than jobs in retail or construction. Sanginov says agroforestry makes for an appealing agriculture alternative. “Agroforestry [on] the slope lands and mountainous regions has great prospects, since Tajikistan is a country with limited land resources and strong demographic growth. Every plot has an owner and if farmers employ anti-erosion measures [and] boost fertility through implementing soil- and water-saving technologies, they could provide [much of the] 80 percent of locally produced food for our population,” he says, referring to the government’s food security goal of growing four-fifth of the country’s food domestically. 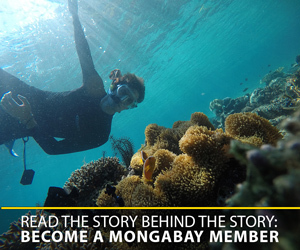 Shamsiddin Nizomiyon, a correspondent with the local newspaper, also participated in the FAO project; he was given nuts and other trees to grow an agroforest on his 1-hectare (2.5 acre) lot. His ancestors used to have agroforestry gardens up to twice that size in the high dehas before Soviet rule. After collectivization, the dehas were relocated down and the land expropriated for the state-owned farms’ livestock, which left empty rangelands and erosion. During World War II wheat was cultivated there, and from 1960 to 1970 these lands were again used for livestock. Nearly 100 hectares of these overused rangelands remain, but now there’s a similar area of agroforestry gardens that stop the erosion, Nizomiyon says. Local people understood the necessity of agroforestry, adds Nizomiyon, who used to head a mahalla, or neighborhood, in Faizobod. New generations also want to establish similar farms, but there aren’t enough land plots for them. “I cannot cultivate the whole hectare, so if I want, I will give the land to my sons and nephews, if they will work there. But they will have to get the knowledge of agroforestry and maybe will bring new varieties from other countries,” he says. His garden yields 4 to 5 tons of apples a year, plus grapes and peaches. Most of it goes to Dushanbe, where it’s sold in local bazaars. With erosion in check and tree cover expanding, the numbers of foxes, wolves, snakes, jackrabbits and medicinal herbs have increased in the area, Nizomiyon says. The only thing he’s worried about is mudslides, which are becoming common. Climate change, which in this area has manifested as heavier rainfall, also plays a part in the frequency of the mudslides: “Intensive raining became more frequent during the last years. To solve the problems of mudslides we need to develop forestry in the upper parts of the rivers in the area and improve the rangelands,” Sanginov says. At a small river nearby, the fallout from a mudslide can be seen as members of the community fix a number of bridges. “We had to do everything ourselves [like] save and protect the houses when mudslides came, and we want this problem to be solved,” says a resident. The solutions will likely be increased tree planting in the mountains above Faizobod and more agroforestry gardens on the slopes below to stop erosion while also feeding the community. This article is part of Mongabay’s ongoing series on agroforestry worldwide.